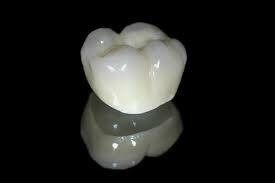 The look and function of a crown are considered when choosing the material most suitable for you. Your dentist will consider the tooth location, the position of the gum tissue, the amount of tooth that shows when you smile, the color or shade of the tooth and the function of the tooth. Your dentist wants to create a crown that looks natural and feels comfortable. To achieve that, several factors are considered including the color, occlusion or ¨bite¨. the shape and length of your natural teeth and your artificial crown. To prevent damage to a crown, avoid chewing hard foods, ice or other hard objects, such as pencils. This is especially important for tooth-colored crowns. Brush three times a day and floss or use an interdental cleaner once a day to remove plaque, a sticky film of bacteria. And see your dentist for regular examinations and professional teeth cleaning. restore a tooth when there isn´t enough tooth remaining to provided support for a large filling. Gold Crowns, Metal-Porcelain Crowns, Zirconia Crowns (Metal free) available in this clinic.